David Muscan '11 earned his nursing degree at age 36. 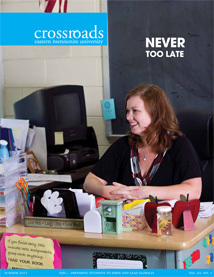 Adult learning at EMU doesn’t begin and end with the Adult Degree Completion Program – older students regularly enroll in the university’s traditional undergraduate programs. Sometimes it’s because they’re after a particular degree not offered through ADCP. Or because they lack sufficient college-level credits (ADCP students must start the program with at least 60 semester hours of previously earned credit). Or because they’re simply interested and able to become fulltime students later in life. It was all of these factors that put Keith Zimmerman ’10 back in the classroom. Zimmerman, who was 37 when he finished his degree in biochemistry, became a father at age 17, forcing him to put his college plans on hold. After supporting himself as a massage therapist for nearly a decade while his children were young, Zimmerman began at EMU as a nursing student. Before long, he switched gears to biochemistry after a general chemistry course rekindled his interest, dating back to junior high, in biomedical research. One of the highlights of his undergraduate career was a research project with biology professor Greta Ann Herin examining the NR1 and NR2b NMDA receptors (“really fascinating” stuff, Zimmerman claims). The college experience as an older student isn’t without its challenges. David Muscan ’11, who was 36 when he graduated with a nursing degree, said he sensed that professors sometimes had higher expectations of him than younger students. 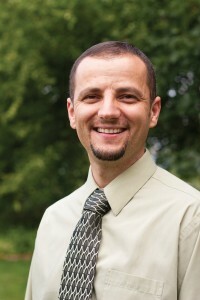 Muscan, originally from Romania, came to EMU in 2007 from Hungary, where his work as a missionary for the previous decade had kept him too busy to finish college. Now working as a nurse at Rockingham Memorial Hospital, Muscan said that a few other older classmates made the non-traditional undergraduate experience seem easier, and that through his classes, he made close friends with students aged 18 to 50. “I survived the course, and even passed,” said Lawton, now pastor of Cedar Hill Community Church in Elizabethtown, Pennsylvania. Lawton, who has taken occasional classes through Eastern Mennonite Seminary since finishing college, said he’s thought about capping his non-traditional education by finishing up his seminary degree, well into his seventies. “Life isn’t over yet,” he said, chuckling. One Response to "Regular Undergrads: Old Approach Still Works, Too"
This is a great way to access Windows which sets the function to provide a battery function for Outlook Sync on the computer.